Rev. Diane joined UUS in 2018 to serve in a transitional capacity. In addition to fulfilling typical ministerial roles, such as Sunday service leadership and pastoral care, she is particularly focused on helping the congregation prepare for its next settled minister. She received training in transitional ministry through the Interim Ministers Network, an ecumenical group whose mission is to strengthen the spiritual and organizational health of the congregation by equipping and supporting those who lead during times of transition. Prior to her role at UUS, Rev. 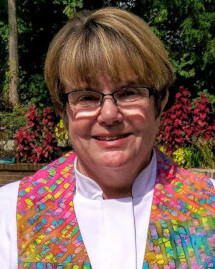 Diane served for two years as interim minister at the Unitarian Universalist Church of Greensboro (North Carolina). She also served for ten years as the minister for the Unitarian Universalist Church of Tucson (Arizona), and earlier served as the minister for the Unitarian Universalist Society of Marietta (Ohio).